The Global IP Project is pleased to announce the release of the Second Edition of Global Patent Litigation: How and Where to Win. Authored by Members of the Global IP Project, the Second Edition includes timely updates and expands on the analysis provided in the first release of the book, including new country chapters for Belgium, Denmark, Mexico, Norway, and Sweden. 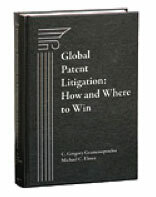 Global Patent Litigation: How and Where to Win, Second Edition, is available for purchase here.